Recreational drug use is the use of a psychoactive drug to induce an altered state of consciousness for pleasure, by modifying the perceptions, feelings, and emotions of the user. When a psychoactive drug enters the user's body, it induces an intoxicating effect. Generally, recreational drugs are in three categories: depressants (drugs that induce a feeling of relaxation and calm); stimulants (drugs that induce a sense of energy and alertness); and hallucinogens (drugs that induce perceptual distortions such as hallucination). Many people also use prescribed and illegal opioids along with opiates and benzodiazepines. In popular practice, recreational drug use generally is a tolerated social behaviour, rather than perceived as the serious medical condition of self-medication. However, heavy use of some drugs is socially stigmatized. 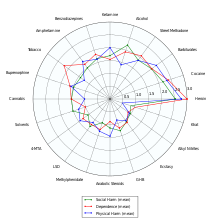 Recreational drugs include alcohol (as found in beer, wine, and distilled spirits); cannabis (legal nationally in certain countries and state/province-wide or locally in others) and hashish; nicotine (tobacco); caffeine (coffee, tea, and soft drinks); prescription drugs; and the controlled substances listed as illegal drugs in the Single Convention on Narcotic Drugs (1961) and the Convention on Psychotropic Substances (1971) of the United Nations. What controlled substances are considered illegal drugs varies by country, but usually includes methamphetamines, heroin, cocaine, LSD, psilocybin mushrooms, MDMA and club drugs. In 2015, it was estimated that about 5% of people aged 15 to 65 had used illegal drugs at least once (158 million to 351 million). Many researchers have explored the etiology of recreational drug use. Some of the most common theories are: genetics, personality type, psychological problems, self-medication, gender, age, instant gratification, basic human need, curiosity, rebelliousness, a sense of belonging to a group, family and attachment issues, history of trauma, failure at school or work, socioeconomic stressors, peer pressure, juvenile delinquency, availability, historical factors, or sociocultural influences. There has not been agreement around any one single cause. Instead, experts tend to apply the biopsychosocial model. Any number of these factors are likely to influence an individual's drug use as they are not mutually exclusive. Regardless of genetics, mental health or traumatic experiences, social factors play a large role in exposure to and availability of certain types of drugs and patterns of drug use. Anthropological research has suggested that humans "may have evolved to counter-exploit plant neurotoxins". The ability to use botanical chemicals to serve the function of endogenous neurotransmitters may have improved survival rates, conferring an evolutionary advantage. A typically restrictive prehistoric diet may have emphasised the apparent benefit of consuming psychoactive drugs, which had themselves evolved to imitate neurotransmitters. Chemical–ecological adaptations, and the genetics of hepatic enzymes, particularly cytochrome P450, have led researchers to propose that "humans have shared a co-evolutionary relationship with psychotropic plant substances that is millions of years old." Responsible drug use advocates that users should not take drugs at the same time as activities such as driving, swimming, operating machinery, or other activities that are unsafe without a sober state. Responsible drug use is emphasized as a primary prevention technique in harm-reduction drug policies. Harm-reduction policies were popularized in the late 1980s, although they began in the 1970s counter-culture, when cartoons explaining responsible drug use and the consequences of irresponsible drug use were distributed to users. Another issue is that the illegality of drugs in itself also causes social and economic consequences for those using them—the drugs may be "cut" with adulterants and the purity varies wildly, making overdoses more likely—and legalization of drug production and distribution would reduce these and other dangers of illegal drug use. Harm reduction seeks to minimize the harm that can occur through the use of various drugs, whether legal (e.g., alcohol and nicotine), or illegal (e.g., heroin and cocaine). For example, people who inject illicit drugs can minimize harm to both themselves and members of the community through proper injecting technique, using new needles and syringes each time, and proper disposal of all injecting equipment. Alcohol is the most widely used drug in Australia. 86.2% of Australians aged 12 years and over have consumed alcohol at least once in their lifetime, compared to 34.8% of Australians aged 12 years and over who have used cannabis at least once in their lifetime. In the 1960s, the number of Americans who had tried cannabis at least once increased over twentyfold. In 1969, the FBI reported that between the years 1966 and 1968, the number of arrests for marijuana possession, which had been outlawed throughout the United States under Marijuana Tax Act of 1937, had increased by 98%. Despite acknowledgement that drug use was greatly growing among America's youth during the late 1960s, surveys have suggested that only as much as 4% of the American population had ever smoked marijuana by 1969. By 1972, however, that number would increase to 12%. That number would then double by 1977. The Controlled Substances Act of 1970 classified marijuana along with heroin and LSD as a Schedule I drug, i.e., having the relatively highest abuse potential and no accepted medical use. Most marijuana at that time came from Mexico, but in 1975 the Mexican government agreed to eradicate the crop by spraying it with the herbicide paraquat, raising fears of toxic side effects. Colombia then became the main supplier. The "zero tolerance" climate of the Reagan and Bush administrations (1981–93) resulted in passage of strict laws and mandatory sentences for possession of marijuana and in heightened vigilance against smuggling at the southern borders. The "war on drugs" thus brought with it a shift from reliance on imported supplies to domestic cultivation (particularly in Hawaii and California). Beginning in 1982, the Drug Enforcement Administration turned increased attention to marijuana farms in the United States, and there was a shift to the indoor growing of plants specially developed for small size and high yield. After over a decade of decreasing use, marijuana smoking began an upward trend once more in the early 1990s, especially among teenagers, but by the end of the decade this upswing had leveled off well below former peaks of use. 2OH. Drinking alcohol creates intoxication, relaxation and lowered inhibitions. It is produced by the fermentation of sugars by yeasts to create wine, beer, and distilled liquor (e.g., vodka, rum, gin, etc.). In most areas of the world, apart from certain countries where Muslim sharia law is used, it is legal for those over a certain age (18 in most countries). It is an IARC 'Group 1' carcinogen and a teratogen. Alcohol withdrawal can be life-threatening. Amphetamines: Used recreationally to provide alertness and a sense of energy. Prescribed for ADHD, narcolepsy, depression and weight loss. A potent central nervous system stimulant, in the 1940s and 50s methamphetamine was used by Axis and Allied troops in World War II, and, later on, other armies, and by Japanese factory workers. It increases muscle strength and fatigue resistance and improves reaction time. Methamphetamine use can be neurotoxic, which means it damages dopamine neurons. As a result of this brain damage, chronic use can lead to post acute withdrawal syndrome. Caffeine: Often found in coffee, black tea, energy drinks, some soft drinks (e.g., Coca-Cola, Pepsi and Mountain Dew, among others), and chocolate. It is the world's most widely consumed psychoactive drug, it has no dependence liability. MDMA: Commonly known as ecstasy, it is a common club drug in the rave scene. Electronic cigarette: A large proportion of e-cigarette use is recreational. Most e-cigarette liquids contain nicotine, but the level of nicotine varies depending on user-preference and manufacturers. Nicotine is highly addictive, comparable to heroin or cocaine. Some people have also used to e cigarette to smoke cannabis or other drugs and there are certain e cigarettes specifically made for the use of smoking liquid cannabis. Ketamine: An anesthetic used legally by paramedics and doctors in emergency situations for its dissociative and analgesic qualities and illegally in the club drug scene. Lean: A liquid drug made when mixing cough syrup, sweets, soft drinks and codeine. It originated in the 1990s in Houston. Ever since then, this drug usage has grown and many people use this at parties becoming popular at the rave scene. Many people would get a drowsy feeling when consuming this drug. Nitrous oxide: legally used by dentists as an anxiolytic and anaesthetic, it is also used recreationally by users who obtain it from whipped cream canisters (whippets or whip-its) (see inhalant), as it causes perceptual effects, a "high" and at higher doses, hallucinations. Tobacco: Nicotiana tabacum. Nicotine is the key drug contained in tobacco leaves, which are either smoked, chewed or snuffed. It contains nicotine, which crosses the blood–brain barrier in 10–20 seconds. It mimics the action of the neurotransmitter acetylcholine at nicotinic acetylcholine receptors in the brain and the neuromuscular junction. The neuronal forms of the receptor are present both post-synaptically (involved in classical neurotransmission) and pre-synaptically, where they can influence the release of multiple neurotransmitters. sublingual: substances diffuse into the blood through tissues under the tongue. Many psychoactive drugs can be or have been specifically designed for sublingual administration, including barbiturates, benzodiazepines, opioid analgesics with poor gastrointestinal bioavailability, LSD blotters, coca leaves, some hallucinogens. This route of administration is activated when chewing some forms of smokeless tobacco (e.g. dipping tobacco, snus). Depressants are psychoactive drugs that temporarily diminish the function or activity of a specific part of the body or mind. Colloquially, depressants are known as "downers", and users generally take them to feel more relaxed and less tense. Examples of these kinds of effects may include anxiolysis, sedation, and hypotension. Depressants are widely used throughout the world as prescription medicines and as illicit substances. When these are used, effects may include anxiolysis (reduction of anxiety), analgesia (pain relief), sedation, somnolence, cognitive/memory impairment, dissociation, muscle relaxation, lowered blood pressure/heart rate, respiratory depression, anesthesia, and anticonvulsant effects. Depressants exert their effects through a number of different pharmacological mechanisms, the most prominent of which include facilitation of GABA or opioid activity, and inhibition of adrenergic, histamine or acetylcholine activity. Some are also capable of inducing feelings of euphoria (a happy sensation). The most widely used depressant by far is alcohol. Stimulants or "uppers", such as amphetamines or cocaine, which increase mental or physical function, have an opposite effect to depressants. Hallucinations and possibly delirium resembling the effects of Datura stramonium can result if the drug is taken in much higher than therapeutical dosages. Antihistamines are widely available over the counter at drug stores (without a prescription), in the form of allergy medication and some cough medicines. They are sometimes used in combination with other substances such as alcohol. The most common unsupervised use of antihistamines in terms of volume and percentage of the total is perhaps in parallel to the medicinal use of some antihistamines to stretch out and intensify the effects of opioids and depressants. The most commonly used are hydroxyzine, mainly to stretch out a supply of other drugs, as in medical use, and the above-mentioned ethanolamine and alkylamine-class first-generation antihistamines, which are – once again as in the 1950s – the subject of medical research into their anti-depressant properties. Analgesics (also known as "painkillers") are used to relieve pain (achieve analgesia). The word analgesic derives from Greek "αν-" (an-, "without") and "άλγος" (álgos, "pain"). Analgesic drugs act in various ways on the peripheral and central nervous systems; they include paracetamol (para-acetylaminophenol, also known in the US as acetaminophen), the nonsteroidal anti-inflammatory drugs (NSAIDs) such as the salicylates, and opioid drugs such as hydrocodone, codeine, heroin and oxycodone. Some further examples of the brand name prescription opiates and opioid analgesics that may be used recreationally include Vicodin, Lortab, Norco (hydrocodone), Avinza, Kapanol (morphine), Opana, Paramorphan (oxymorphone), Dilaudid, Palladone (hydromorphone), and OxyContin (oxycodone). Stimulants, also known as "psychostimulants", induce euphoria with improvements in mental and physical function, such as enhanced alertness, wakefulness, and locomotion. Due to their effects typically having an "up" quality to them, stimulants are also occasionally referred to as "uppers". Depressants or "downers", which decrease mental or physical function, are in stark contrast to stimulants and are considered to be their functional opposites. Use of stimulants may cause the body to significantly reduce its production of natural body chemicals that fulfill similar functions. Once the effect of the ingested stimulant has worn off the user may feel depressed, lethargic, confused, and miserable. This is referred to as a "crash", and may provoke reuse of the stimulant. ^ Global Overview of Drug Demand and Supply (PDF). World Drug Report 2017. United Nations. 2017. p. 13. ISBN 978-92-1-148291-1. Retrieved 9 June 2018. ^ Staelens, Stefanie (10 March 2015). 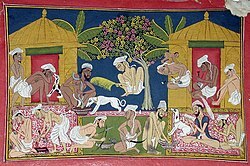 "The Bhang Lassi Is How Hindus Drink Themselves High for Shiva". Vice.com. Retrieved 10 August 2017. ^ Roger J Sullivan; Edward H Hagen; Peter Hammerstein (2008). "Revealing the paradox of drug reward in human evolution". Proceedings of the Royal Society B: Biological Sciences. 275 (1640): 1231–1241. doi:10.1098/rspb.2007.1673. PMC 2367444. PMID 18353749. Retrieved 24 January 2019. ^ R. J. Sullivan; E. H. Hagen (2000). "Psychotropic substance-seeking: evolutionary pathology or adaptation?" (PDF). Retrieved 25 January 2019. ^ Stampfer MJ, Kang JH, Chen J, Cherry R, Grodstein F (January 2005). "Effects of moderate alcohol consumption on cognitive function in women". N Engl J Med. 352 (3): 245–53. doi:10.1056/NEJMoa041152. PMID 15659724. ^ Hines LM, Stampfer MJ, Ma J (February 2001). "Genetic variation in alcohol dehydrogenase and the beneficial effect of moderate alcohol consumption on myocardial infarction". N Engl J Med. 344 (8): 549–55. doi:10.1056/NEJM200102223440802. PMID 11207350. ^ Berger K, Ajani UA, Kase CS (November 1999). "Light-to-moderate alcohol consumption and risk of stroke among U.S. male physicians". N Engl J Med. 341 (21): 1557–64. doi:10.1056/NEJM199911183412101. PMID 10564684. ^ Mukamal KJ, Conigrave KM, Mittleman MA (January 2003). "Roles of drinking pattern and type of alcohol consumed in coronary heart disease in men". N Engl J Med. 348 (2): 109–18. doi:10.1056/NEJMoa022095. PMID 12519921. ^ Nutt, David (7 March 2011). "There is no such thing as a safe level of alcohol consumption - Professor David Nutt". the Guardian. ^ ""Drug harms in the UK: a multi-criteria decision analysis", by David Nutt, Leslie King and Lawrence Phillips, on behalf of the Independent Scientific Committee on Drugs". The Lancet. 2 November 2010. ^ "Failed states and failed policies, How to stop the drug wars". The Economist. 5 March 2009. Retrieved 10 March 2009. ^ Moyer, VA; U.S. Preventive Services Task, Force (6 May 2014). "Primary care behavioral interventions to reduce illicit drug and nonmedical pharmaceutical use in children and adolescents: U.S. Preventive Services Task Force recommendation statement". Annals of Internal Medicine. 160 (9): 634–9. doi:10.7326/m14-0334. PMID 24615535. ^ "WHO Report on the Global Tobacco Epidemic, 2008" (PDF). ^ "Global Status Report on Alcohol 2004" (PDF). ^ a b "National Drug Strategy Household Survey 2016: detailed findings". Australian Institute of Health and Welfare. The Australian Institute of Health and Welfare. 28 September 2017. ^ David Farber (2004). The Sixties Chronicle. Legacy Publishing. p. 432. ISBN 978-1412710091. ^ a b c d e f g h i "marijuana: History of Marijuana Use". infoplease.com. ^ MacDonald, Keza (5 November 2014). "Why Are Drugs Always So Lame in Video Games?". Vice. Retrieved 16 November 2014. ^ "Agents Classified by the IARC Monographs" (PDF). ^ Trevisan, Louis A.; Boutros, Nashaat; Petrakis, Ismene L.; Krystal, John H. "Complications of Alcohol Withdrawal" (PDF). Alcohol Health and Research World. 22 (1): 61–66. ^ John Philip Jenkins. "methamphetamine (drug) – Britannica Online Encyclopedia". Britannica.com. Retrieved 29 January 2012. ^ Cruickshank, CC; Dyer, KR (July 2009). "A review of the clinical pharmacology of methamphetamine". Addiction. 104 (7): 1085–1099. doi:10.1111/j.1360-0443.2009.02564.x. PMID 19426289. ^ Malenka RC, Nestler EJ, Hyman SE (2009). "15". In Sydor A, Brown RY (eds.). Molecular Neuropharmacology: A Foundation for Clinical Neuroscience (2nd ed.). New York: McGraw-Hill Medical. p. 370. ISBN 978-0-07-148127-4. Unlike cocaine and amphetamine, methamphetamine is directly toxic to midbrain dopamine neurons. ^ "Pharmacokinetics and Pharmacodynamics of Methylecgonidine, a Crack Cocaine Pyrolyzate". aspetjournals.org. ^ Fandiño, Anabel S.; Toennes, Stefan W.; Kauert, Gerold F. (1 December 2002). "Studies on Hydrolytic and Oxidative Metabolic Pathways of Anhydroecgonine Methyl Ester (Methylecgonidine) Using Microsomal Preparations from Rat Organs". Chemical Research in Toxicology. 15 (12): 1543–1548. doi:10.1021/tx0255828. ^ Rahman, Muhammad; Hann, Nicholas; Wilson, Andrew; Worrall-Carter, Linda (2014). "Electronic cigarettes: patterns of use, health effects, use in smoking cessation and regulatory issues". Tobacco Induced Diseases. 12 (1): 21. doi:10.1186/1617-9625-12-21. PMC 4350653. PMID 25745382. ^ Grana, R; Benowitz, N; Glantz, SA (13 May 2014). "E-cigarettes: a scientific review". Circulation. 129 (19): 1972–86. doi:10.1161/circulationaha.114.007667. PMC 4018182. PMID 24821826. ^ Holbrook, Bradley D. (2016). "The effects of nicotine on human fetal development". Birth Defects Research Part C: Embryo Today: Reviews. 108 (2): 181–92. doi:10.1002/bdrc.21128. ISSN 1542-975X. PMID 27297020. ^ Siqueira, Lorena M. (2016). "Nicotine and Tobacco as Substances of Abuse in Children and Adolescents". Pediatrics. 139 (1): e20163436. doi:10.1542/peds.2016-3436. ISSN 0031-4005. PMID 27994114. ^ de Andrade, Marisa; Hastings, Gerald. "Tobacco Harm Reduction and Nicotine Containing Products" (PDF). Cancer Research UK. Cancer Research UK. p. 8. ^ Albert Hofmann. "LSD My Problem Child". Retrieved 19 April 2010. ^ "Brecher, Edward M; et al. (1972). "How LSD was popularized". Consumer Reports/Drug Library". Druglibrary.org. Retrieved 20 June 2012. ^ United States Congress (24 October 1968). "Staggers-Dodd Bill, Public Law 90-639" (PDF). Retrieved 8 September 2009. ^ Hofmann A, Heim R, Tscherter H (1963). "Phytochimie – présence de la psilocybine dans une espèce européenne d'agaric, le Psilocybe semilanceata Fr." [Phytochemistry – presence of psilocybin in a European agaric species, Psilocybe semilanceata Fr.]. Comptes rendus hebdomadaires des séances de l'Académie des sciences (in French) 257 (1). pp. 10–12. ^ Wonnacott S (February 1997). "Presynaptic nicotinic ACh receptors". Trends in Neurosciences. 20 (2): 92–8. doi:10.1016/S0166-2236(96)10073-4. PMID 9023878. Archived from the original on 1 February 2013. ^ "Erowid DMT (Dimethyltryptamine) Vault". Erowid.org. Retrieved 20 September 2012. ^ "ATIVAN® 1 mg SUBLINGUAL TABLETS; ATIVAN® 2 mg SUBLINGUAL TABLETS". home.intekom.com. Retrieved 8 July 2016. ^ "MSDS Glossary". Archived from the original on 17 January 2009. Retrieved 1 January 2009. ^ Morgan Christopher J.; Abdulla A.-B. Badawy (2001). "Alcohol-induced euphoria: exclusion of serotonin". Alcohol and Alcoholism. 36 (1): 22–25. doi:10.1093/alcalc/36.1.22. ^ Foster, Steven (2002). A field guide to Western Medicinal Plants and Herbs. New York: Houghton Mifflin Company. p. 58. ISBN 978-0395838068. ^ "NIDA - Research Monographs - Monograph Index" (PDF). drugabuse.gov. ^ Al Zarouni, Yousif (2015). The Effects of Khat (Catha Edulis) (First ed.). London: Yousif Al Zarouni. pp. 4–5. ISBN 978-1-326-24867-3.